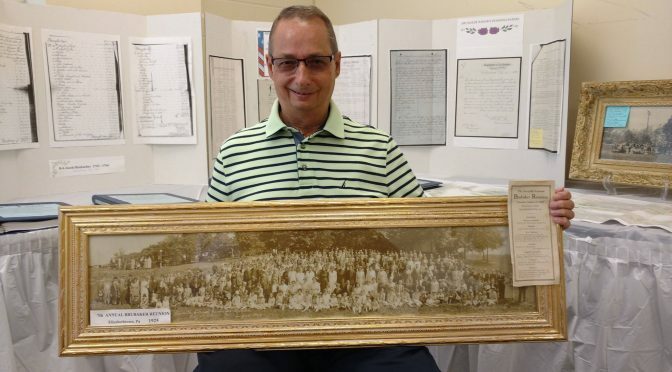 Pictured above is Ray Brubaker of the ‘A’ line of the family holding a framed portrait from the 1925 Reunion. He is also holding a program from that event, of which his Grandfather and Great-grandfather were participants. Saturday August 5th saw a break in the hazy, hot, and humid conditions. This made for perfect weather for the long-awaited Dedication Ceremony Saturday morning of the Memorial Plaque in nearby Noel Dorwart Park. The Dedication Ceremony was witnessed by an assembly of almost 200 people, along with a Color Guard of Boy Scouts, Cub Scouts and Brownies, accompanied by PA 41st District Representative Brett Miller, retired State Senator Mike Brubaker, East Hempfield Township Supervisors and Brubaker cousins Doug Brubaker and Ed Lefevre; Lancaster Mennonite Historical Society Executive Director Rolando Santiago, and as Mistress of Ceremonies, Lori Burkholder of WGAL-8. 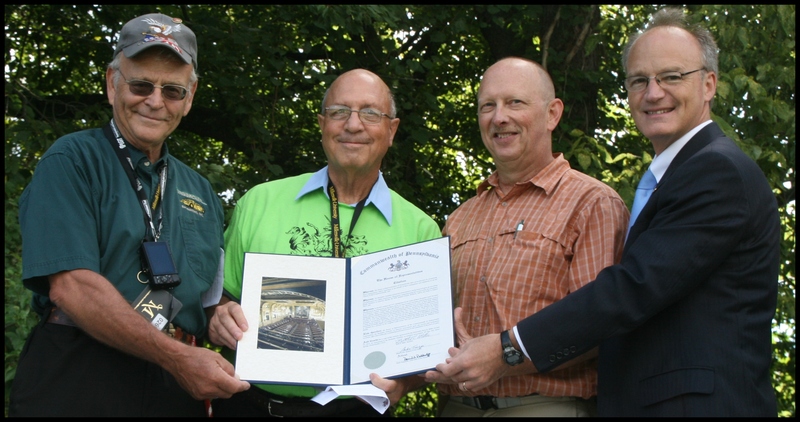 Representative Miller presented a Citation from the PA House of Representatives recognizing the Brubaker Families of America and this 300th Anniversary celebration. The stream of walk in registrants continued, as they joined our other participants. We continued with our lineup of featured speakers and their presentations as we had on Friday. Featured speakers continued with presentations and break out sessions; as did the tours like on Friday. The genealogy room was busy again as people came to see images, family trees and to discuss with the Association Historian their lineage. The evening keynote address was delivered by Dr. Gerald Brunk, historian, impersonator, and retired professor at Eastern Mennonite College of Harrisonburg, VA. 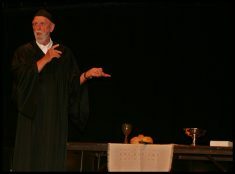 He presented his highly regarded impersonation of Menno Simons on his “Road to Decision” when he underwent his personal conversion and subsequent resignation from the Roman Catholic priesthood, joining the Dutch Anabaptists. 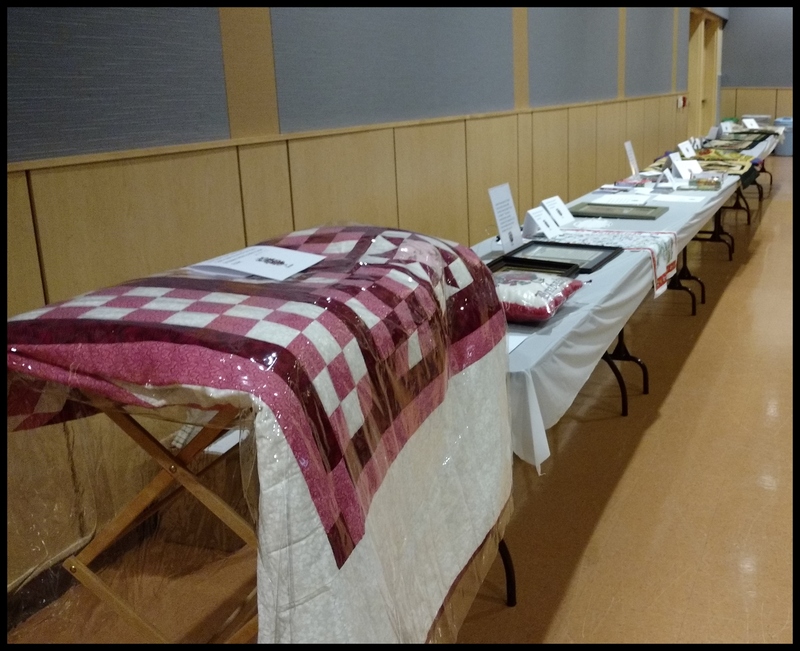 After Dr. Brunk’s evening presentation there commenced an auction of various donated items, many with Brubaker family ties. Among the items were quilts, wall hangings, and latched rugs along with the Brubaker historical pieces. The highlight was the auctioning off of the original 300th Anniversary fraktur, designed and created by Brubaker cousin Lynn Sommer. Below are images from the day’s events.